As a former Labour voter, I felt it. Like the distant memory of a former lover it sang ‘Johnneeee, remember meeee?’ Woah..wake up you eejit! 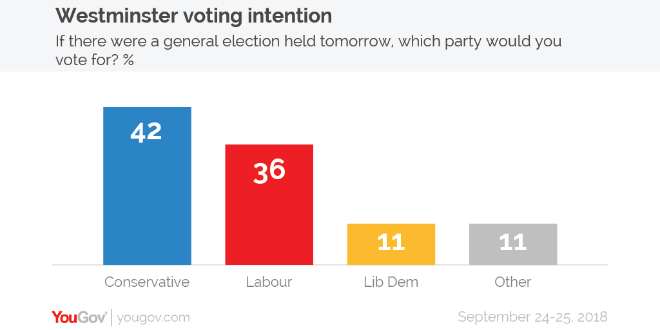 Despite Brexit, Boris and Theresa, some ripped-off SNP policies and a popular swing against austerity, the UK Labour Party cannot pull ahead in polls or in recent electoral results. See the above tracker for only part of the evidence. This was done before the Labour conference but it’s not clear that has done them much good. Maybe a second Brexit vote will keep Scotland in the EU so I won’t need to abandon Labour in Scotland? 61% of voters think they knew fine why they voted. Will ‘remain’ win next time? Sure? Think voters will take it more seriously in a second vote? Sure? Think Labour won’t ally with the Tories and shoot themselves in the foot this time? Think Labour in Scotland will be united and make sense in the next campaign? Sure?